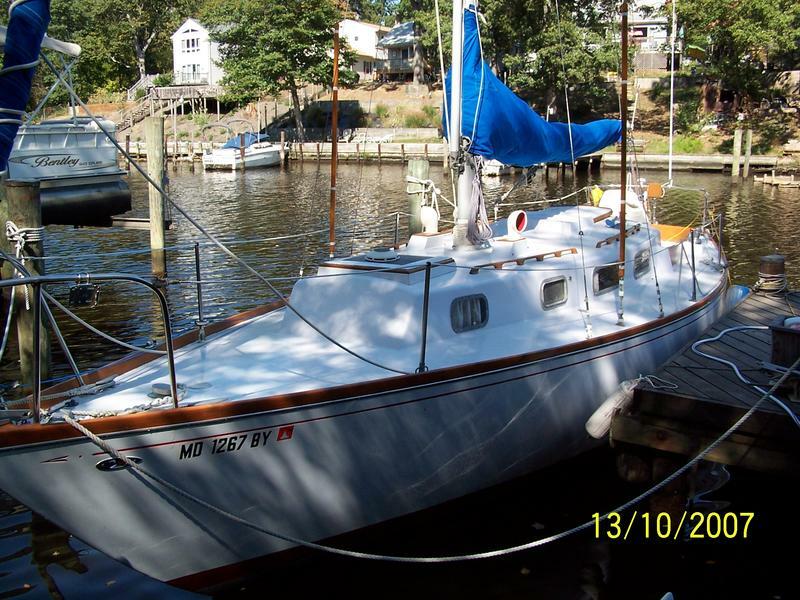 This Model T34C sailboat is ready to sail when launched. She is a beautifully designed vessel and easy to sail. She is very popular throughout the Chesapeake Bay with clubs and a great website supporting this classic design. Many social events are available for this sailboats owner(s). 	Exterior is White topside highlighted with a Red waterline, and Blue bottom. Paint includes Awlgrip with the Bottom coated with Interlux Bottomcote. 	Bottom is solid with No blisters. 	Topside Teak includes toe rails, lazarette hatches, cockpit fairings, hatch and trim, prepared and sealed with five coats of Cetol finish. 	Custom cushions accommodate cockpit seating. 	A SS helm is provided on an Edson pedestal. 	Steering is also provided by an Autohelm ST4000 autopilot. 	Additional features in the cockpit are a Magellan FX 324 Map Color GPS unit with NMEA inputs to the VHF/FM transceiver providing constant emergency position data. The VHF RAM is also located on the steering pedestal. 	Emergency pump at cockpit operates the Whale high volume emergency bilge pump. 	Engine gages/controls are located in the cockpit. 	Many huge storage areas with internal lighting located under the cockpit seats. 	SS Fresh Water Heater, electrical or coolant water sources. 	Remote Engine Temp Sensor. 	Origo SS 2-burner alcohol stove with chopping block cover. 	Closed Shower with Hot and Cold Fresh water SS sink.